Posted on Sunday, October 7th, 2012 at 9:26 pm. Once again, my university makes a splash in the Asian blogosphere and is highlighted in the metropolitan newspaper for having overtly racist students. Angry Asian Man, Colorlines, and the Columbus Dispatch all covered a new tumblr called OSU Haters, which highlights outrageous tweets by students of my beloved place of higher education, The Ohio State University, some of them by the afore mentioned OSU Asian twitter account. It seems that my first post about racial encounters in social media was only the beginning. OSU Haters was started by a former hater who got into some serious trouble because of their insensitivity. Now reformed, he or she created OSU Haters to re-educate those who suffer from the same kind of hate. The blog is a nod to another tumblr account, Hunger Games Tweets, which you should really check out, if you haven’t already. Take a look at some excerpts by the fine specimens of the human race, as posted by OSU Haters. These guys didn’t even bother with the veil of a fake handle like OSU Asian. Let’s ignore the racism for a moment. What’s With Capitalizing The First Letter In Every Single Word? Yet, you can’t be bothered with any punctuation? Because, you know, that’s not illegal or anything. Let’s go back to separate but equal? Classy, are they not? I think we can all agree that these are deplorable human beings. In response to OSU Haters the Vice President, the President, as well as many other administrators have made comments about how unacceptable these comments are. What I haven’t heard is how things are going to change. Scolding is fine, but I want some teeth in those words. Because people are not getting the picture. One of the tweeters was found and gave a few words to the Dispatch. Wow…I mean, WOW. This individual has just told us that he think that he has done nothing wrong. “Racism shouldn’t be tolerated”? You mean yours? If I ever meet this person I want to say I’d give them a piece of my mind but I might just be to shocked and have too much steam shooting out of my ears to say a word. Excuse me, sir, your white male privilege is showing. 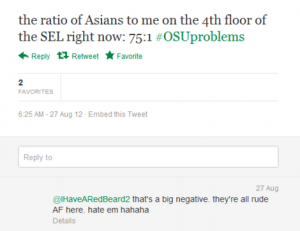 The fact of the matter is that there is an uptick in racial resentment against Asians at Ohio State, and most of the tweets featured on OSU Hater are about Asians, particularly international students. One of the factors is the rise in the number of international students. Ohio State makes a huge effort, like many other schools, to promote diversity and up their numbers of international students. A growing proportion of them are Chinese students. But the majority of our population is still white. Less than 18% of our students are of color, and 80% of the student body is from Ohio. Potential for tension? You better believe it. In my first post, I highlighted a racial experience of success. But it ain’t always rainbows and unicorns. I found a tweet on OSU Haters posted by a girl I know. I wasn’t terribly surprised by it, unfortunately. Along with this tweet were hundreds documenting her underage drinking, but that’s a whole different issue. Anyways, it was only a matter of time before I saw someone I knew on that tumblr, and it might as well be this girl. The sad part is that we went on a service trip together. Oh, the irony. Despite all, I thought this might be a good teaching moment. I wasn’t mad at her, I just wanted her to understand. So I wrote her this little Facebook message. You might know this already, there’s a tweet of yours on osuhaters.tumblr.com. I’m not sure you’ve heard about it, but it’s getting a lot of attention so I’d be careful about what you post on twitter. People really are starting to get in trouble for this kind of thing. On a personal note, it’d also be nice if you didn’t think about Asians as such a monolithic group, because we’re not. You may not think it’s a big deal or anything, but the opinions you express actually adversely affect me as an individual, and on an aggregate level, the effect is huge. Help a girl out, and don’t perpetuate the stereotypes. Normally, I’m not one to ever say “peace and love,” but I thought it might soften the tone, since she tends to say things like that. (I think…maybe I’m assuming things about her, too). Anyways, I sent it and promptly forgot about the whole thing. Until two weeks later when I was going through my messages and saw that not only had she not replied, but she had unfriended me. Well, that I did not expect considering we got along fine during the service trip we went on together. Perhaps she hates me. Maybe she was so embarrassed she couldn’t even stand to be Facebook friends anymore. It’s possible she thinks that I’d report her to the university. I really have no clue, but speculation isn’t really going to clear things up. I still wonder what she really thought about the whole thing, but I suppose I’ll never know. Sometimes we just have to let it go if the timing isn’t right, or the person isn’t ready. Or if I’m not ready. So I’m back to square one. But this won’t be the last of me! Adrea, Not the article I was expecting. It is a shame, but social networking sites are still a free speech outlet and people have a right to their opinions no matter how stupid or insensitive they may be. It is even worse when it spills over into your childrens accounts. The only thing we can do is let there stupidity shine and hope they are humiliated enough by the public to keep it to themselves.